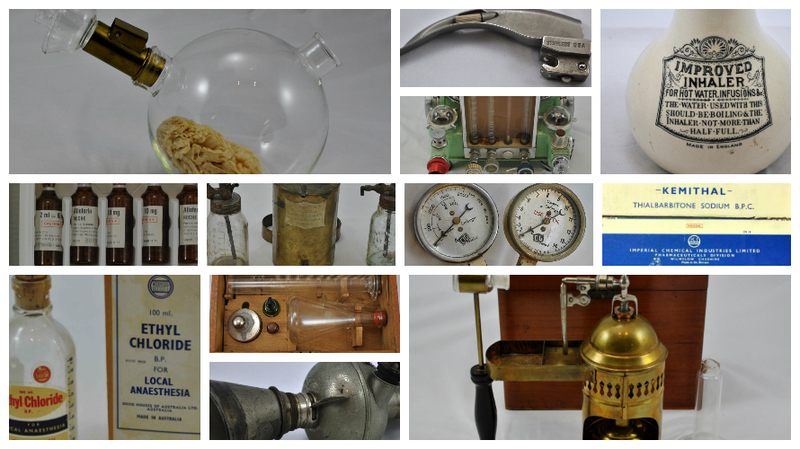 L to R: Morton Ether Inhaler, Macintosh Laryngoscope Blade, Gillies Portable Anaesthetic Machine, Inhaler c.1890, Alloferin- muscle relaxant, Vaporiser. Through the ages humans have sought to understand the sensation of pain. Aristotle believed pain was caused by evil spirits entering the body via injury. During the Renaissance pain was believed to be a punishment from god. Today we understand that pain is a response that has evolved to ensure the body avoids harm. A message, sent from nerve receptors in your tissues to your brain resulting in an action that will endeavour to alleviate your pain. At some point in the life of almost every human being pain relief will be required. The Harry Daly Museum of the Australian Society of Anaesthetists allows visitors to explore humanity’s quest for the relief from pain. From the use of the poppy and mandragora, to the discovery of curare and thence today’s highly advanced pharmaceuticals. Visitors can explore the complex history of our search for oblivion and the processes and practices prescribed by professionals to achieve it. Highlighting uniquely Australian advancements in the science and practice of anaesthesia the Harry Daly Museum will enlighten all. To explore our online collection please visit our eHive account.